Today an old lady with dementia called Margaret Thatcher was cremated amid a media circus and very limited interest from the general public. The crowds were more or less gone from the capital by 11:30 in spite of the hype. 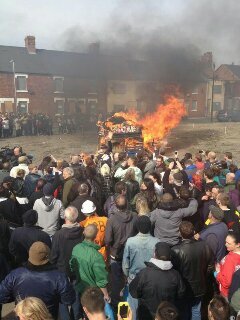 Meanwhile in the former mining community of Goldthorpe, South Yorkshire Mrs. T was cremated in effigy. These people showed far less respect than did the likes of Cameron and Osborne for the woman they blame for the destruction of their little community. And yet I can’t help but feel uncomfortable at the idea that a death, anyone’s death is a cause for celebration. Don’t get me wrong, I hated Thatcher. I hated her policies and I hated what she did to working people, especially in the North. I rejoiced when she was kicked out of office by her own party and again when the tories were defeated in ’97. But that was about removing an aggressor. The death of an old woman with dementia is different. I won’t mourn her but I can’t celebrate. I can’t blame those who do though. 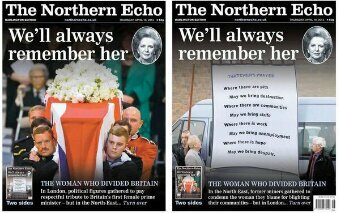 Thatcher was cruel and vindictive and the hypocritical, sycophantic eulogising by ConDem MPs and others over the last week has stirred up some very bitter memories. Not that all our politicians tried to rewrite history. Some were much more honest. Although I can’t celebrate, I do object strongly to the waste of public money on a funeral that very few people thought appropriate. Crowds were sparse for the spectacle and many that were there turned up only to protest. 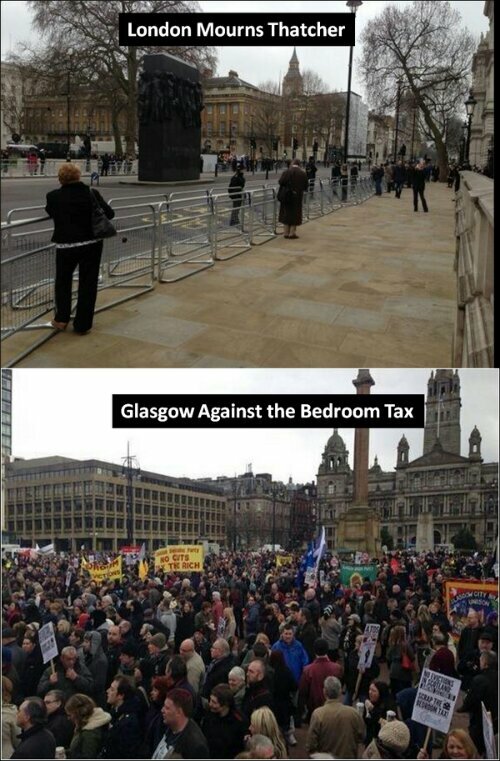 Many more people protested the bedroom tax in Glasgow recently than watched Maggie Thatcher’s state funeral. More people bought copies of ‘Ding dong, the witch is dead’ than turned out for the ‘send off’ and social media is awash with people complaining bitterly about the whole travesty. So before you fall for the misleading hype spilling out of the sycophantic BBC stop and think for a moment. No truly great stateswoman would have engendered such hatred that it spans the generations and left whole communities devastated for decades. 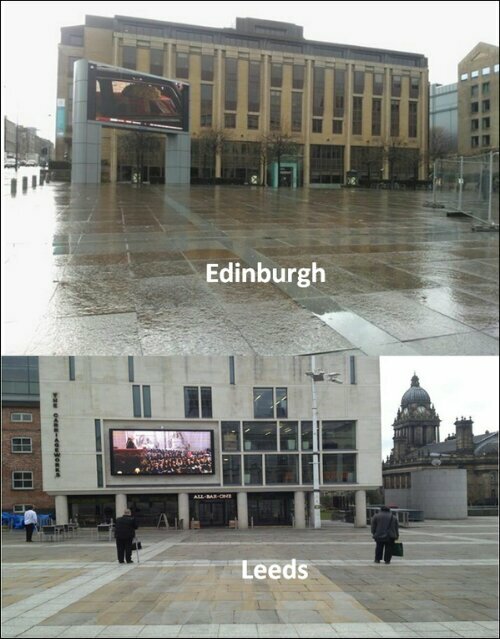 This was the scene in Leeds and Edinburgh today where the service was televised live for the ‘benefit’ of locals. Not the most compelling viewing, it seems. For my own part – I wore red. That was my protest. ‘Wear red Wednesday’ wasn’t a celebration of death but a low key, dignified protest at pointless extravagance that really seems to be little more than an extended party political broadcast for the conservatives. Others pointedly turned their backs as the gun carriage bearing Mrs. T.’s corpse trundled past. No cheering, no rejoicing there – just a dignified rejection. Margaret Thatcher has been described as Britain’s best peacetime Prime Minister. So here’s an opportunity to test that claim. The image below compares her legacy with that of Clement Atlee (“That nice Mr. Atlee” as my late grandmother described him). Go on – judge for yourself.